Taco! Burrito! What's comin' outta your Speedo?! Actually, you don't need to answer that, we just got caught up in the moment on account of our Spartan spirit! We've got spirit, yes we do, we've got spirit, how 'bout you? 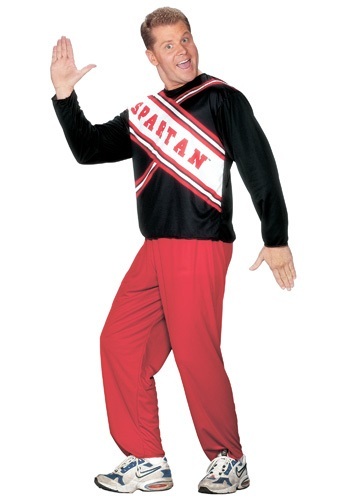 Then you'd better suit up in our exclusive Spartan Cheerleader Costume and be ready to get the crowd worked up! Wooooo! Whether it's at a school football game, chess tournament, or even just the cafeteria, the unstoppable cheerleading duo of Craig and Arianna are always ready to cheer on Spartan High School. Their creative and positive routines bring out the school spirit in every student and faculty member, even if they sometimes get a little too enthusiastic and distracting. But, they never let it get them down, since they're always on the lookout for the perfect cheer, and nothing can stop them from being the best cheerleaders in Spartan history! Even if they don't make the squad, they'll still try out again next year, and the next, and the next, because real Spartan cheerleaders are born, not made, and Craig knows it's his destiny to don his school colors with pride! Speaking of school colors, we've designed this officially licensed costume to look just like the uniform worn in the classic Saturday Night Live skit, so you can show your Spartan pride, too! The shirt features the school colors and name printed across it, so there is plenty of spirit to spare. Throw on your favorite pair of sneakers to complete this look, and get ready to debut your latest cheer! It's better than the women's Spartan cheerleader costume, but not much. Very thin, cheap material. When you spend this kind of money on a costume, you really expect just a bit better quality. We had the same experience with the Zoolander costume from last year. Get better quality products, or we are shopping elsewhere next year. Pants were a bit short but I am over 6ft.